The Woodlands is an upscale suburban town about an hour away from Houston. 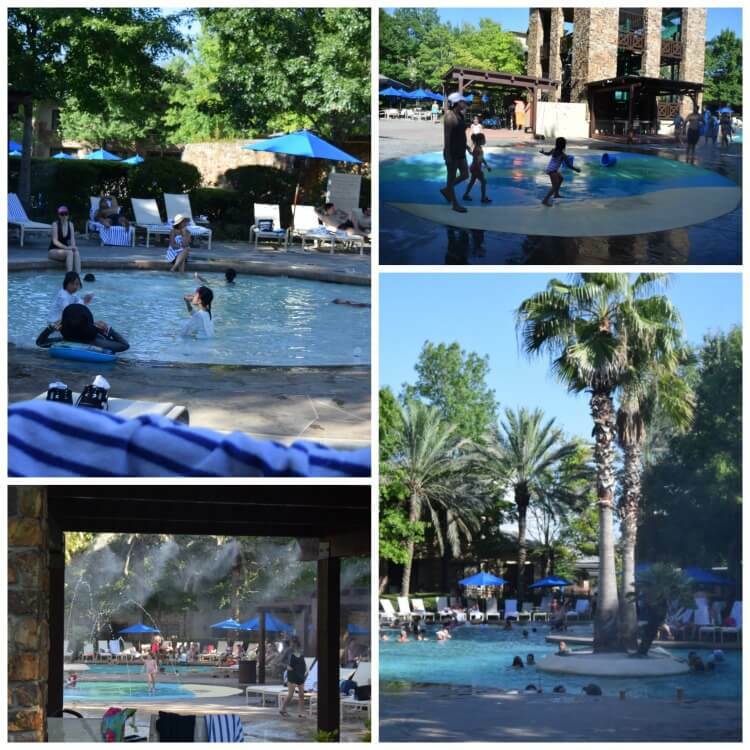 The Woodlands Resort is a luxurious tucked away place that’s perfect for some fun and relaxation for the whole family. When we arrived, they had fresh hot chocolate chip cookies for the whole family at the front desk as well as delicious flavored waters. 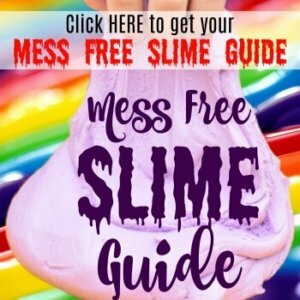 They also give you rubber bracelets that you can easily remove to give you . I just hate the water park resorts that require you to keep a bracelet on at all times. You can also purchase a couple additional bracelets if you have someone who’s not staying with you but who wants to hang out with you at the water park. Our oldest daughter attends college 30 minutes from The Woodlands, so she and her college roommate came along with us just for the first day to the water park. The resort is spread over the property, so your room might be a bit away from the front desk, but parking is easy to find near your building, and all the buildings back up to the water park area. 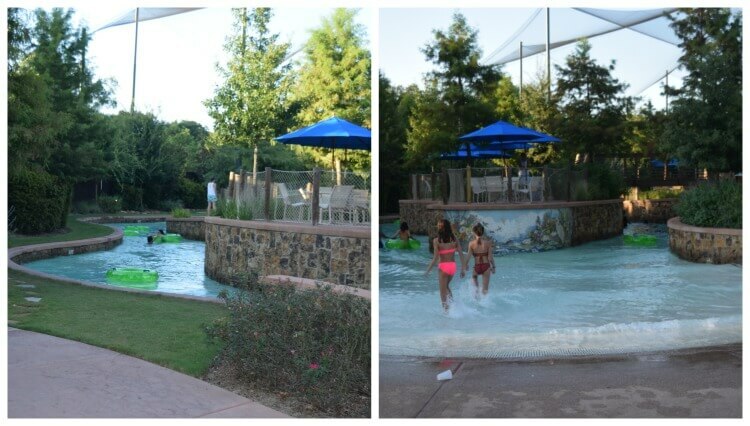 The Woodlands Resort is full of amenities from multiple restaurants to a relaxing spa to an award-winning golf course, but as a family with big and little kids, we wanted to check out their water park! It has a big slide a lazy river and several pool areas. 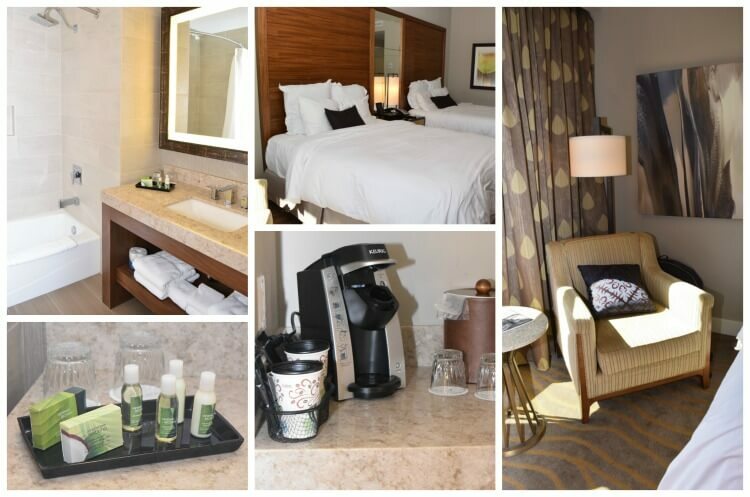 Our room was beautiful with a view of the golf course and fountain. The beds were very comfy. Our room came with a small fridge and a Keurig machine. I really liked the bathroom because it was not tiny. The water park was spacious with several areas. There are absolutely TONS of chairs all around with covered areas to keep you shaded as well as misters to keep you cool. We had no trouble finding a place to sit down. 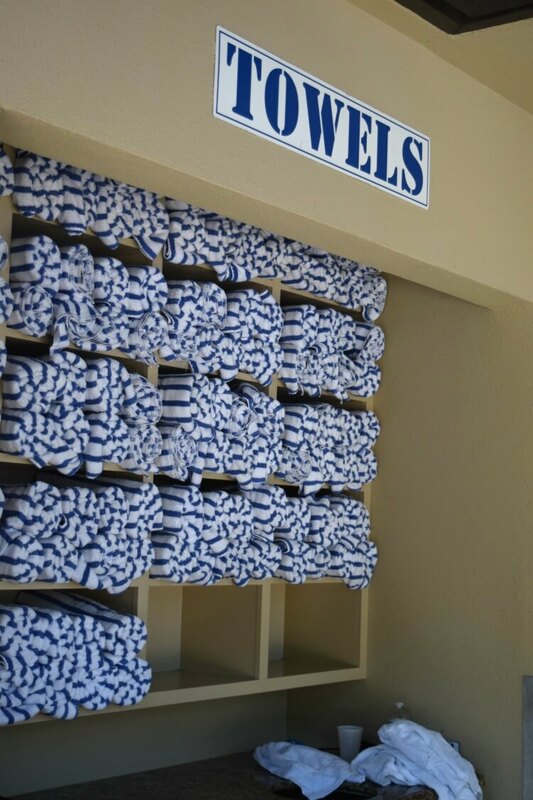 There is also a towel bar where you just show them your bracelet and get towels for the whole family. I love a water park resort where I don’t need my own towels. We did not arrive until late in the afternoon, so we unfortunately, only saw the tail end of the DJ’s show. I could tell it was fun with games for the kids. They had a zero depth area for the babies and toddler. They also have a small pool for little kids, and they have a HUGE pool that had a 3-story slide. At the end of the day, when it’s time for the “dive in” movie, they close up the slide and pull out a big screen to watch the movie. I recommend staking out a place early in the evening in front of the largest pool to get a good place for the movie. Further down in the water park is a small lazy river complete with tubes. My big kids spent most of their time in there. 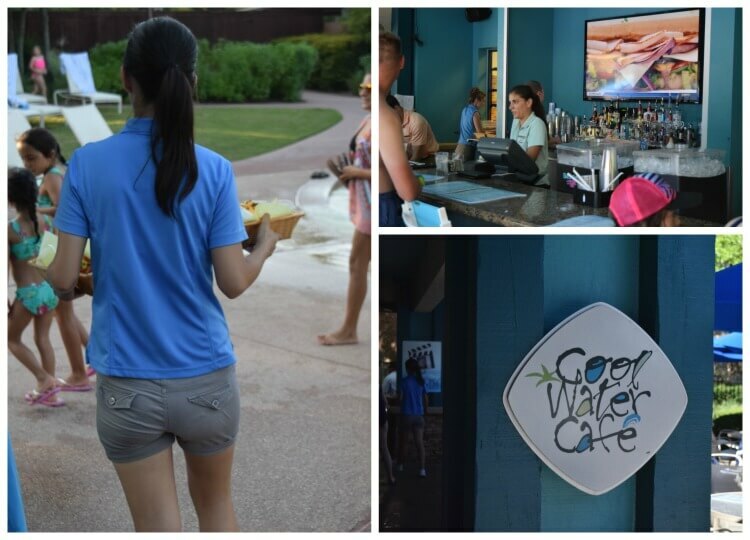 My husband and I spent most of our time in the large pool using the Cool Water Cafe to order food and drinks from staff right from inside the pool. We had some fun drinks and shared a delicious sandwich while relaxing and holding our youngest – the baby. 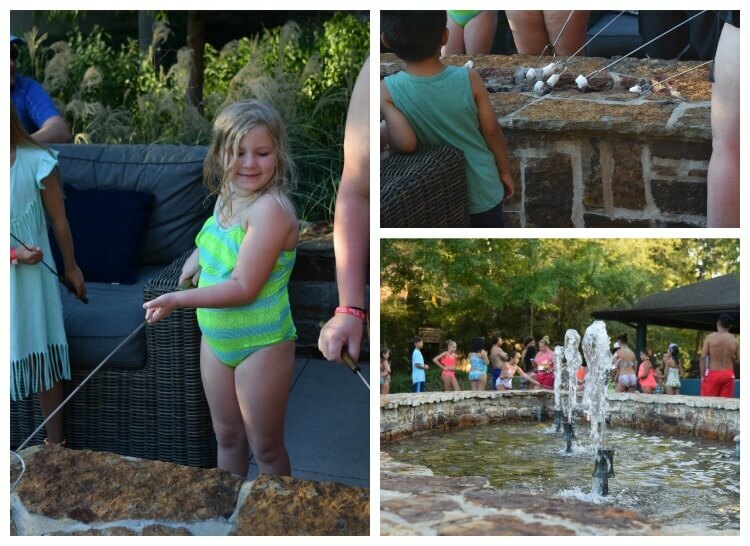 When it was almost time for the movie, the staff set up a few different areas for making your own s’mores! We loved this part! While still in swimsuits, we were able to roast our marshmallows and make a yummy treat. There were a lot more people making s’mores at the stations set up near the pool, but we found the s’mores stations set up at our hotel building had no wait at all. 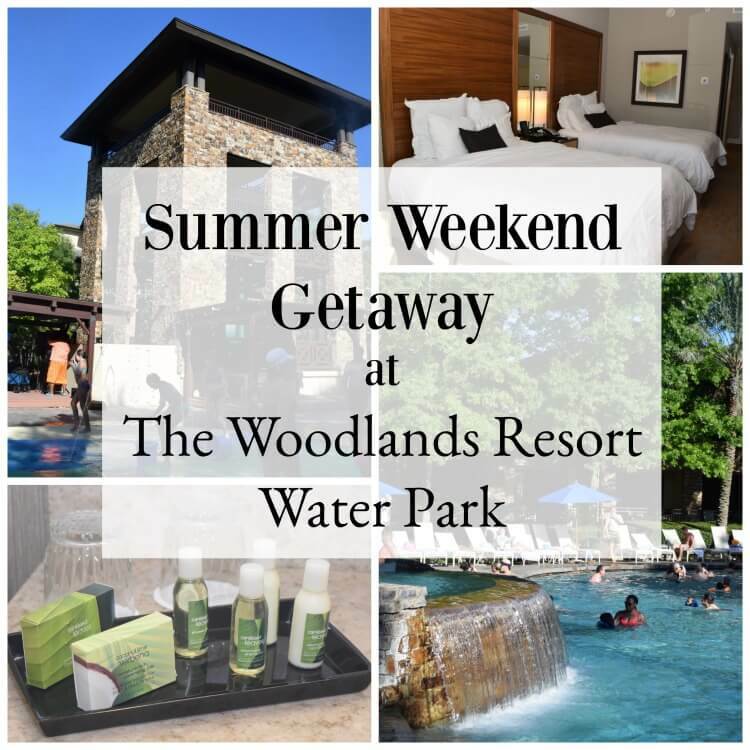 If you’re looking for a fun weekend away in Texas for the whole family or maybe a relaxing stay at a spa and a round of golf, check out The Woodlands Resort. The water park and its amenities are open through Labor Day.